Your site is probably suffering from this one very common issue. It impacts the search engines and your visitors. It's usually not too difficult to fix, but worth it no matter the cost. Search engines love fast sites. Visitors love fast sites. What's not to love? 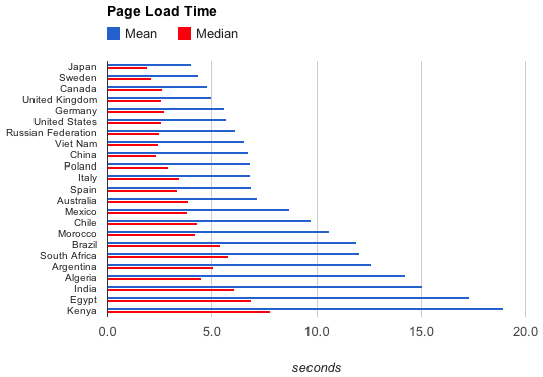 Your site needs to be faster - I'll almost guarantee that your site loads too slowly. Our site for example (goupward.com) loads in about 1.4 seconds on second view, but over 6 seconds on the first view. That's too slow. Our goal is to get any site that is optimized to be under 3 seconds load time. This is not possible in all cases as sometimes there are image requirements, include files, etc that exceed the ability to be loaded quickly, but in most cases, if you start the design of a site with speed in mind, you can achieve < 3s load times. Avoid "the speed trap" of designing a highly visual site when speed is your number one objective. There is nothing wrong with a highly visual site or with a fast site, but you'll need to establish a priority when designing. You don't need to be in the sub 3 club to have a fast site though. If you can get your site to load in less than 5 seconds you're still in good company. Google performed a test wherein slowing down the search results page by 100 to 400 milliseconds had a measurable impact on the number of searches per user. Half a second can make all the difference when it comes to the feverish, fickle visitor. Even more convincing, Google announced that they would be using site speed as a ranking factor. Simply stalling any increases in your site load times will be an accomplishment. Load time is increasing across the board, and we have to get this in check. It's almost as if web development community has become drunk on fast internet speeds, and it's time for some tough love. If you're curious about your site speed, take a look at http://www.webpagetest.org/. They have a nice tool that will give you visual overviews and detailed breakdowns regarding your website site speed. If you move down the path of optimizing your site for speed (specifically for search engine performance), look first at the TTFB (Time To First Byte) measurement. This is the number that seems to have an impact on search engine performance. Search engines find that measuring a fully rendered page may be too subjective for impact on rankings, so they tend to use the TTFB as a primary measurement. Moz took the time to break it all down for us. Start with testing your site. Then work to incrementally improve your speed. You'll find this to be a great experience that will improve your current site and prepare you for your next site build-out.